Caption slip reads: "Photographer: Sandusky. Date: 1951-09-29. 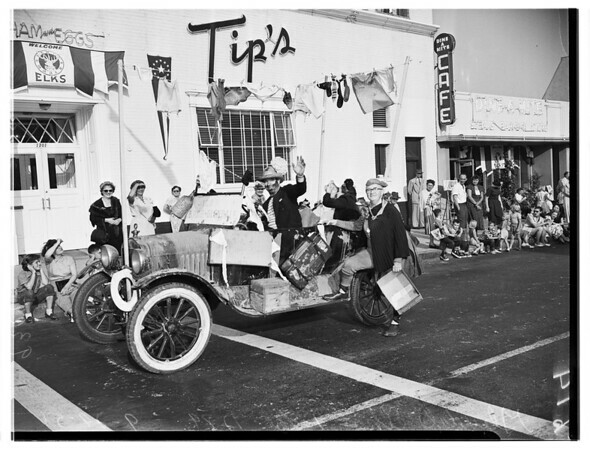 Assignment: Elks parade, Santa Monica. D1: Huntington Park lLodge 1415 -- there are several negs on Huntington Park floats, can be identified by looking at negs. D11: 'Father of Freedom' entered by Oxnard Elks Lodge 1443. D12: The Pasadena 'Toppers'. D13: Burbank Elks Lodge 1497 Mounted Troop. D14: Glendale Elks Lodge 1289".